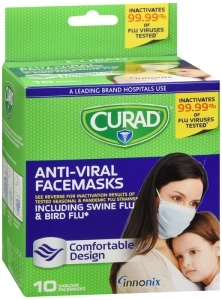 Face mask with pleats inactivates 99.99% of tested influenza viruses on 5 minutes contact with the surface of the mask. Tested on specific seasonal flu viruses, Pandemic H1N1, Avian, Swine and Equine, the mask has a hydrophilic plastic coating that rapidly absorbs aerosol droplets away from the outer surface of the mask. Active Ingredient: Citric Acid 2%, a pH Lowering Agent, Copper 1.6% and Zinc 1.6%, Which Forms Ionic Bonds with Negatively-Charged Side Groups on Influenza Viruses. DISPOSABLE. SINGLE USE ONLY. This mask does not eliminate the risk of contracting any disease or infection. Replace if damaged or soiled with blood or other bodily fluids. Do not use if hypersensitive to copper or zinc. This mask does not contain natural rubber latex. For use in medical settings only. If mask becomes soiled, please change to a new mask as the antimicrobial agents may not be effective. For adult use only.